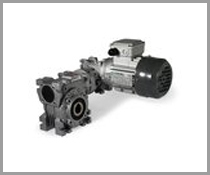 ⇒ Leading applications: general purpose, medium and fractional power drives. ⇒ Design: 7 sizes; housings and covers of aluminium die cast up to size 85, of cast iron for size 110; single worm/wheel units; ratios up to i=100. 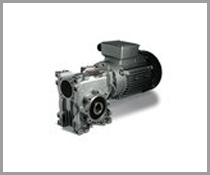 ⇒ Leading applications: general purpose, medium and fractional power drives; reduction ratios and efficiencies higher than similar drives obtained with two- stage worm/wheel units. 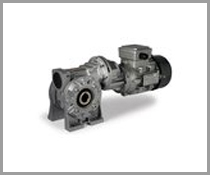 ⇒ Design: 9 sizes; housings and covers of aluminium die cast up to size 85, of cast iron from size 110; single helical stage & worm/wheel units; ratios up to i=800. 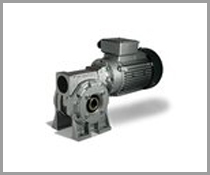 ⇒ Leading applications: general purpose, medium and fractional power drives; high reduction ratios. ⇒ Design : 9 sizes; housings and covers of aluminium die cast up to size 85, of cast iron from size 110; ratios up to i=10000. 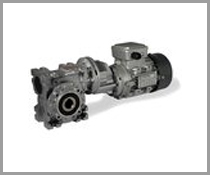 ⇒ Leading applications : general purpose, medium and fractional power drives; reduction ratios and efficiencies higher than similar drives with two-stage worm/wheel units. 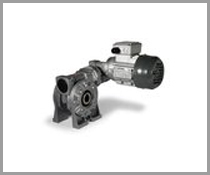 ⇒ Design : 7 sizes; housings and covers of aluminium die cast up to size 85, of cast iron for size 110; helical stage and single worm/wheel units; ratios up to i=800. ⇒ Design: 7 sizes; housings and covers of aluminium die cast up to size 85, of cast iron for size 110; ratios up to i=10000.